Can Florida's governor engineer a comeback? ST. PETERSBURG, Fla. -- It was precisely the sort of event that Gov. Charlie Crist loves: a nonpartisan, non-ideological chance to boost Florida, its people and its weather. Ironically, it was also a moment rooted in partisanship, a news conference on Tuesday capping an effort by leaders from around Tampa Bay to persuade Republicans to bring their national convention here in 2012. Crist happens to be in a tough Republican primary for a U.S. Senate seat, and this would have been the perfect occasion for tossing some red meat to the hard-core conservatives who find him too moderate and too conciliatory. But Crist didn't go there. Instead, he praised a "unified effort" to win the convention and, with the wide smile that is his trademark, admitted, "I am terribly biased about my Florida." Behind him, a banner that included the slogan for the local convention-wooing effort, "Catch the Wave," may have inadvertently summarized Crist's political troubles. Even six months ago, Crist was still the favorite in his primary contest with Marco Rubio, a young, handsome and resolutely conservative Cuban-American politician. But it is Rubio who caught the wave of conservative anger at President Obama. Riding anti-government fervor, Rubio has turned Crist into the underdog. Rarely have polls swung so sharply. Last May, one survey found Crist with a 37-point lead on Rubio. Early last month, a poll showed Rubio with a 34-point advantage. Yet in an interview after the news conference, Crist seemed content, his smile as warm as ever. He said he enjoyed his debate with Rubio on Fox News last Sunday. He used the encounter to call attention to a joint investigative report by The St. Petersburg Times and The Miami Herald on Rubio's alleged private use of funds from two political committees he controlled. "The more people hear about the reality of Marco Rubio instead of the idea of Marco Rubio, they don't like what they see," Crist told me, adding he was not worried that going on the attack might clash with his nice guy image. "I always enjoy telling the truth." And there is at least some evidence in the most recent polls that it's now Rubio's turn to come back to earth. One showed Crist within 11 points, though others showed a gap still in the 20- to 25-point range. There is probably no politician in the country who has suffered more than Crist from the complete collapse of Obama's standing among Republicans. Early last year, Crist's buoyant moderation -- "He's the sunny side of conservatism," said Greg Truax, Crist's campaign chair in Hillsborough County -- looked the perfect GOP antidote to an Obama who stood astride the political landscape. Crist was almost alone among members of his party in endorsing the president's stimulus plan last year. He appeared with Obama at a pro-stimulus rally -- and he hugged him. It was the hug that launched a thousand attacks, the visual backdrop for Rubio's charge that Crist would not stand up to the president. What's intriguing is that Crist is not backing down. Instead, he is using his support for the stimulus as a mark of his political courage and his willingness to "put people over politics." 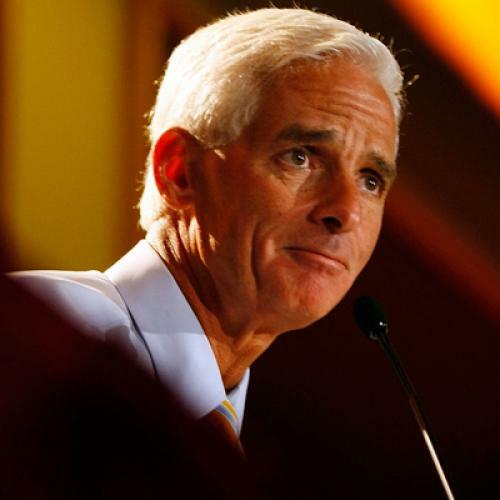 "I was truthful and I was honest and I was forthright and I said we needed it," Crist said of the stimulus money. He ticks off the numbers and categories of jobs that would have been lost in Florida without the federal help he endorsed and names the nearby Republican governors who accepted stimulus dollars. He longs for a political world that seems to have vanished. "The bickering you see day in, day out on cable television between Republicans and Democrats is pretty nauseating." Crist's allergy to quarreling makes some Republicans suspect that he would really like to run as an independent, though he has denied this. Fortunately for Crist, the primary is not until Aug. 24. A race that has swung so far in one direction may yet have one more big swing in it. Crist sees the turn against him as the product of a very bad economy, the "disappointment and concern and fear" it has bred, and the fact that "some people speak to that fear." If that fear abates even a bit in the coming months, it will be good for Barack Obama -- and very good indeed for the sunny Charlie Crist.